I'm often asked for wedding rsvp examples and also what RSVP stands for. "Répondez s'il vous plaît", is a French phrase that translates to "please respond" or literally "respond, if you please"
Requesting an RSVP is standard practice on wedding invitations. You will want to confirm numbers with your venue as soon as possible. If some guests are unable to attend it will also give you an opportunity to invite anyone you may have on a stand by list. If you're planning a destination wedding I would always recommend requesting an RSVP as far in advance as you can to help you with your planning process. You can supply your guests a separate RSVP card which they can post back to you or alternatively list your contact details directly on the invitation. I would also suggest including an RSVP by date for your convenience. For example RSVP by the 1st of May. One benefit of sending out a printed RSVP card is that you can use it to request meal options as well as ask for any dietary or other requirements as shown in the example below. If you're planning a destination wedding or having a travel theme why not consider an Airline Ticket or Boarding Pass style invitation. 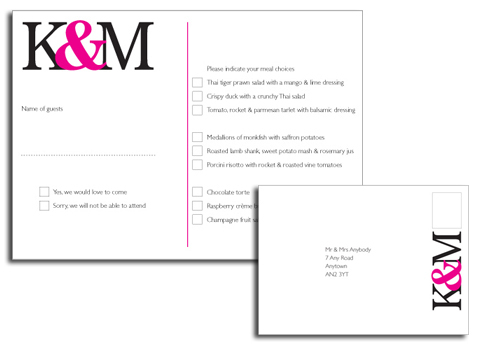 These come supplied with a tear off section which is a great way to request an RSVP. The wording and design can be customised to your requirements. After lots of enquiries about RSVP postcards to match Passport Invitations I have now introduced a detachable tear off RSVP postcard. This can be created for standard 4 sided passports or even the multipage ones if you have lots of information for your guests. Passports still come with the authentic rounded corners and now there is the tear off postcard section for your guests to use as an RSVP - they just have to stick on a stamp and post! 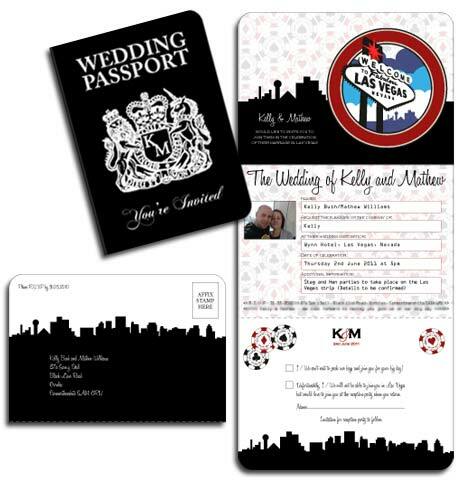 Don't forget that passport invitations, along with all my designs, can be customised to suit your theme. Colours, wording, images etc can all be changed to produce truly unique contemporary wedding invitations for your big day. Contact me for more details about Passport Invitations with Tear Off RSVP or any bespoke design solutions. RSVPs for Save the Dates? It's not customary to request people reply to your Save the Date with their intention to attend or not. Tradition would say you should send a formal invitation to everyone on your guest list who received a Save the Date regardless of whether you know if they can/can't make the wedding. I'm all in favour of certain wedding traditions but personally this isn't one I'd choose to stick to. Planning a wedding can be a stressful and costly process, anything that makes that process easier and perhaps cheaper sounds good to me. If your venue choice will depend on how many people attend whether that's because of size, cost or location I don't see the harm in politely requesting a response to a Save the Date. The Luggage Tags and Boarding Passes/Airline Tickets I design can all incorporate a tear off RSVP section or alternatively you can request RSVPs via an email address or phone number. Consider including a date for people to reply by otherwise they might not realise you're waiting to hear back from them. Contact me if you're looking for a wedding RSVP example and I'll get back to you as quickly as possible.